Happy Saints: Show a Eucharistic Miracle slideshow this Corpus Christi! Show a Eucharistic Miracle slideshow this Corpus Christi! The Feast of Corpus Christi is just around the corner! How do you plan to introduce the Real Presence of Jesus in the Eucharist to the kids and family? Here's an idea: present and narrate a slideshow story of one of the great Eucharistic Miracles of the Church, such as the famous Miracle of Lanciano, where the Host changed into real Flesh. 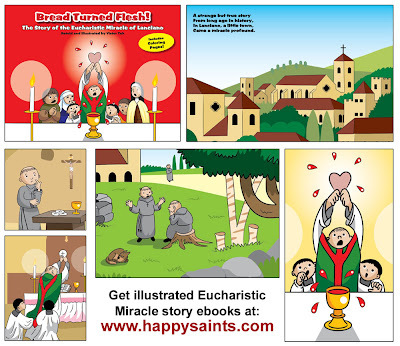 The 'True Tales of the Eucharist' ebooks feature illustrated stories of real miracles that are easily presented as PDF slideshows using a computer, a projector or a tablet. Great for kids of all ages. They are printable too and coloring pages are included!